Who wants loads and loads of foundation and concealer on their face on a hot summer day? Well, me neither. 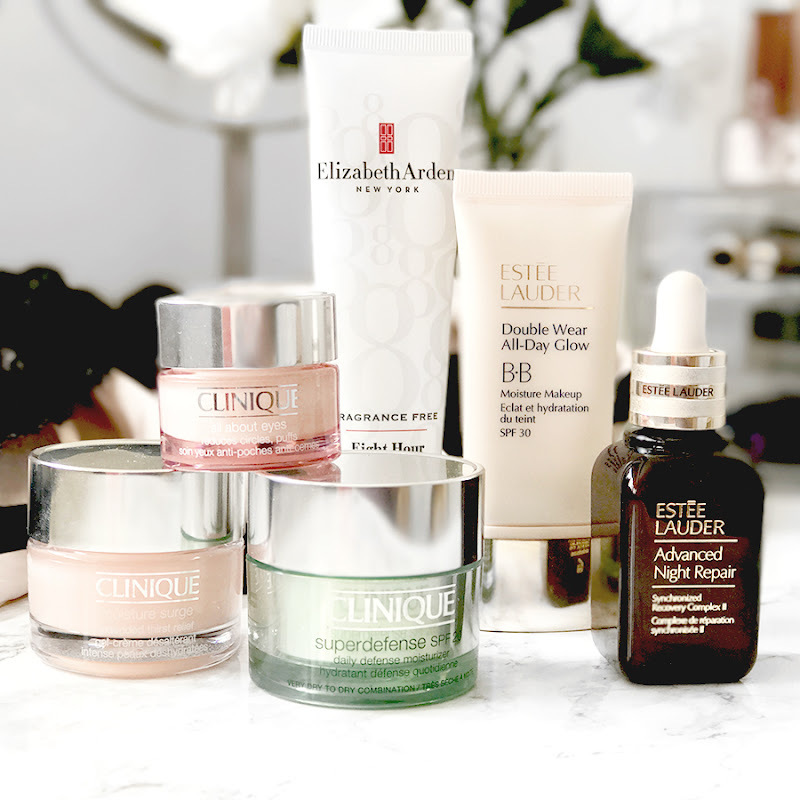 So the right skincare is even more important to me in the summer months. In contrast to winter, I love light textures, perfecting formulas but it still has to be hydrating. And I think I found the perfect routine for me. So I just had to share it with you. I don't use any oils and only a minimum amount of serums in the summer. 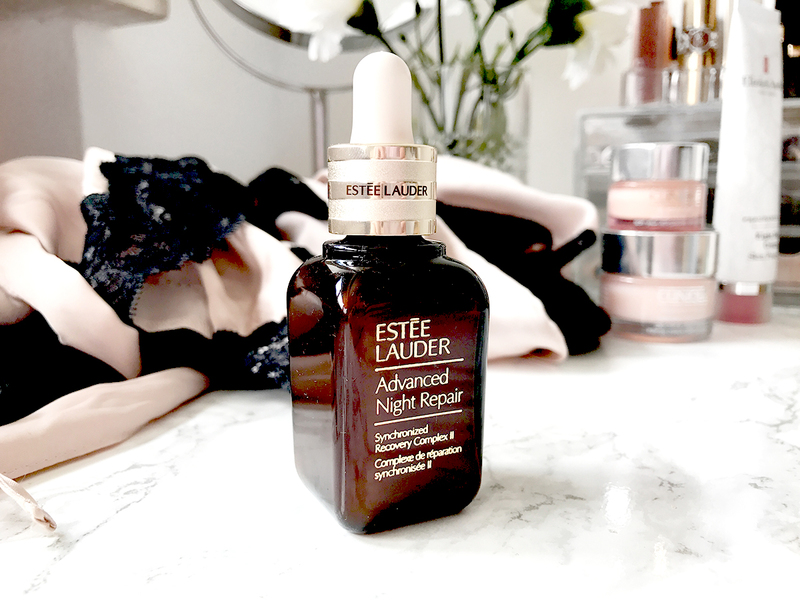 If I want a special treatment, I use my beloved Estee Lauder Advanced Night Repair. But this doesn't happen daily. I like to keep it simple in the warmer months. Let's start what I use at night. 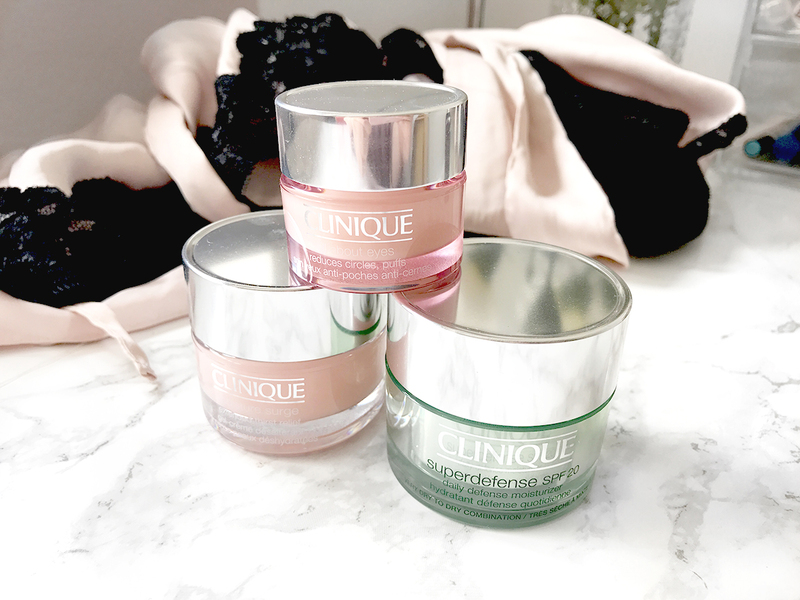 I have recently fallen in love with Clinique products, one of my favourites is the Moisture Surge creme. So light, but super hydrating! Exactly what I need. For my eye cream, I go for the All About Eyes also by Clinique. Again a very light gel texture. I might switch to the rich version once the autumn/winter comes back around. I love matte lipsticks, also in the summer, so my lips always have to be in perfect condition (no one wants to use a matte lipstick on dry and cracked lips.. THE WORST!) 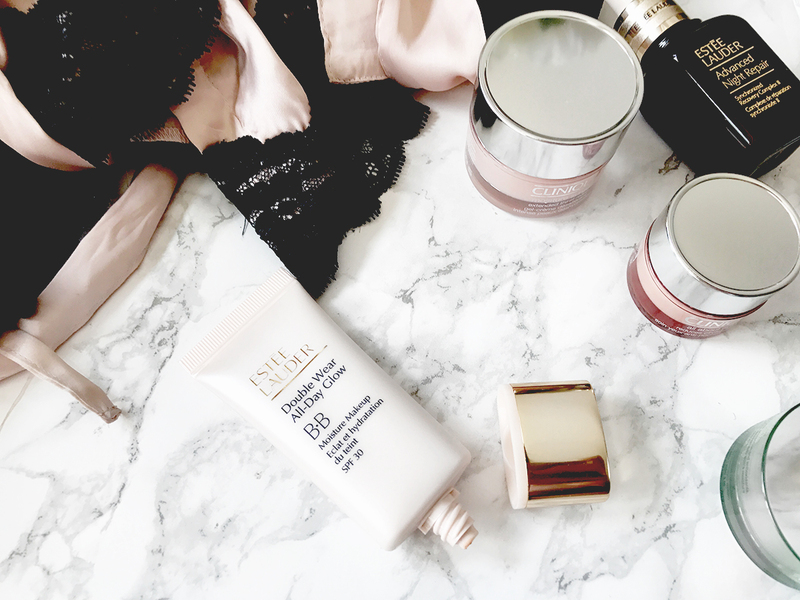 For this I love my ultimate multitasking product, the Elizabeth Arden Eight Hour Cream. You can use it for seriously everything, but I love it for my lips. There is a special lip balm version, but I just use the regular cream, as I can also use it on any dry patches on my face or my body.. seriously such a staple! 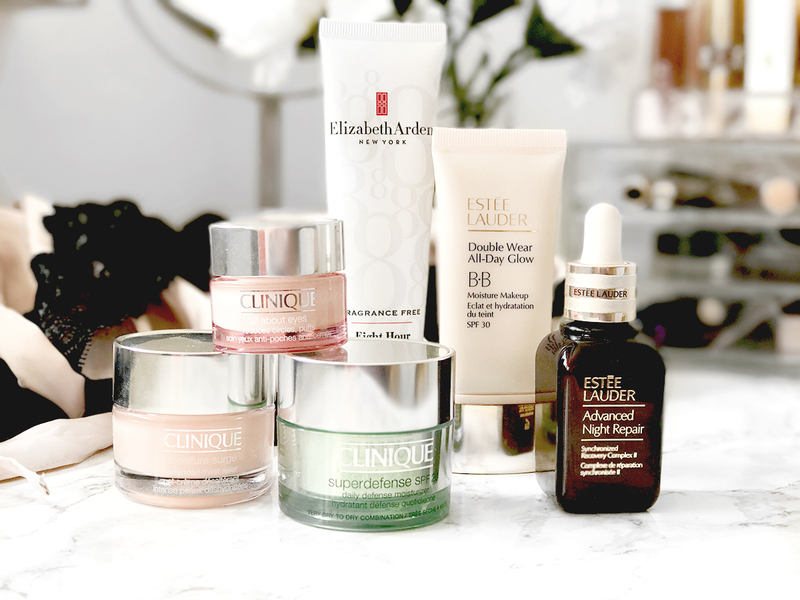 When it comes to skincare in the morning I just skip the eye cream completely. I know some people use it also before doing their makeup but I just feel my concealer would move way too much. For moisturizer, I love the Clinique Superdefense one. It has SPF 20, and protects your skin throughout the day while being extremely light. Obsessed! I know this might already be a part of my makeup routine, but I personally love using my BB creams even on a no-makeup day. I love this natural but perfected look. My BB cream of choice is currently the Estee Lauder Double Wear All-Day-Glow BB Cream. Even though the name might suggest, it has nothing to do with the standard Double Wear foundation, which is very heavy and full coverage. The only similarity is the lasting power. I can wear it all day, even when it's extremely hot (and a bit TMI: I sweat so much on my face haha..). So it is such a genius product for me. The finish is more a light coverage but very glowy. THE summer foundation/BB cream! I hope you liked my little summary of my summer skincare routine. I would love to hear about your go-to products! Today I want to talk to you about something more personal than my favourite highlighter or my latest sunglasses purchase. I hope you like the variety here on my blog. I really do enjoy talking about the superficial things in life but from time to time I feel an urge to share some thoughts on a more serious and important subject. So this is what I do in today's post. You probably already know what I want to talk about today from the title (or the picture haha). I would like to discuss and share with you my thoughts on positive thinking and how it really does affect all aspects of your life. I think I have always been a pretty positive person. I do believe that people have a tendency to be either a more optimistic or a pessimistic character. But I also believe that you can train your thoughts and your outlook on things. Some of you might think, why would it even matter what I think.. it doesn't affect what is happening. And I am sorry but I have to disagree. 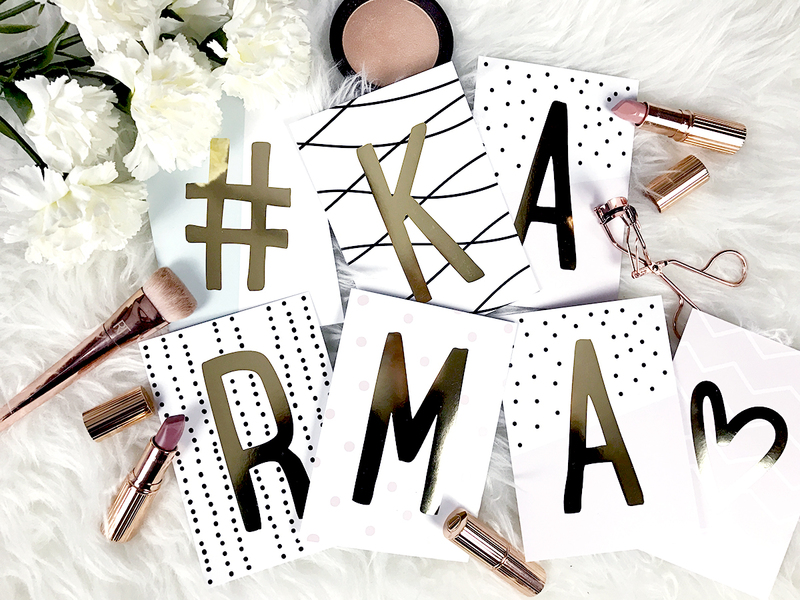 Some might call it Karma, others might call it the Law of attraction. I can relate to both but it doesn't really matter how you want to title it. The basic meaning is still the same: what you give, you get. By giving I don't mean only giving actual things. I also mean the thought or the words you give out to this world. As much as I do believe in the power of the universe, I understand that not a lot of people can identify with this kind of thinking. But there are much more logical things behind this theory than just a blind trust in the universe. Let's look at it in a more direct and realistic way. If you radiate positivity through your words and your thoughts you attract other people who have a similar outlook. It also works the other way. If you have very negative thoughts, they will always show in your words and your actions. That will attract other people who think and act in a similar way. Someone who enjoys life and has trust in their future will be less likely to interact with someone who has a negative and pessimistic outlook on things. And the people around you have an impact on your mood, which will impact your thoughts and then impact your actions. And in the end, your actions have the biggest impact on your future and your life. Imagine you are sitting with a group of friends and everyone is moaning about how your classes and exams have nothing to do with your future job and why would you even learn all that and everything you do is so pointless. Would you feel motivated to sit down and study? Or will you be more likely to watch some Netflix and forget about your "pointless" classes? So yes, your thoughts have a direct connection to your future. It is no magic power which converts your wishes and thoughts into reality. It is just you. And whether you do it consciously or subconsciously.. you should stop believing that your thoughts have no power over your future. There is no such thing as a fixed destiny, you create your own future. So think positive and surround yourself with positive people. And by the way, this is one thing that I love so much about my boyfriend. I might be the more positive person of the both of us, but he keeps on motivating me to work harder, push harder and be the best version of myself. Everyone should have this kind of person in their life. I could talk about this subject for years and years. There are so many more reasons to why I believe that positive thinking will give you a positive life. But this is the basic idea. If you want me to talk more about these things just let me know.. I would happily do so. And always remember.. you create your own reality. 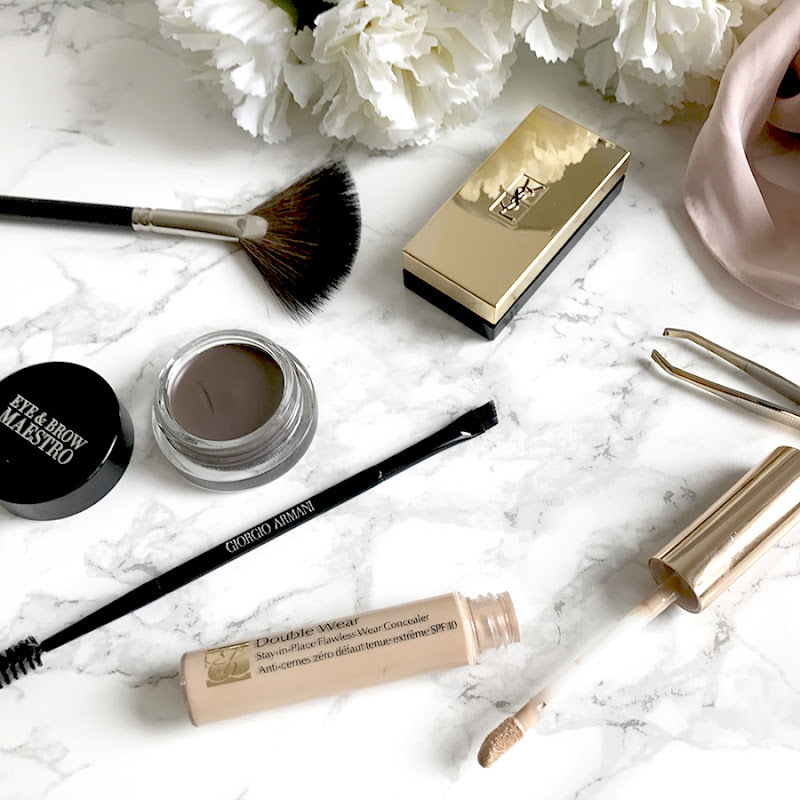 How I do my Eyebrows: Armani Eye & Brow Maestro. 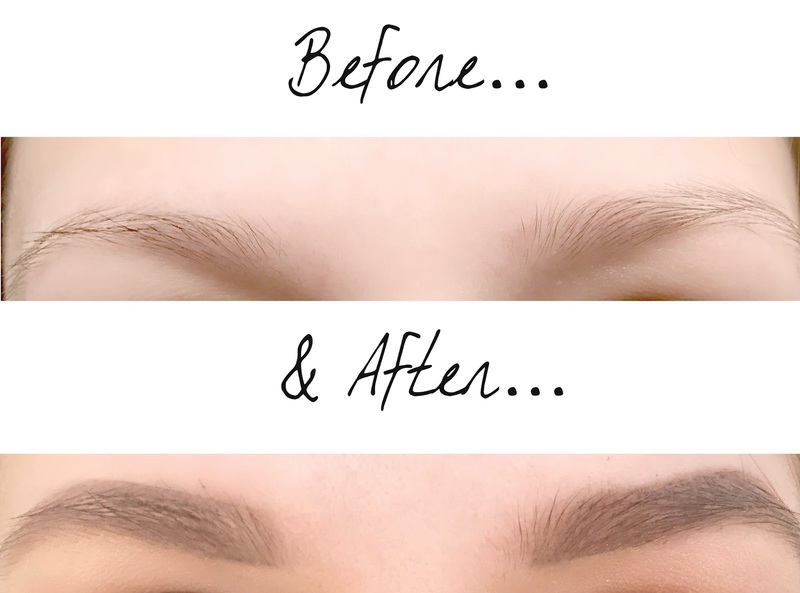 Recently I have gotten a lot of questions regarding my eyebrows and how I do them. So today I thought I would do a whole post on them. I hope you enjoy! First off, I know there are probably loads of girls who just use one product and that's it. But that's not me haha... Unfortunately, I have very thin and light brows, so they need a little bit more extra work. Earlier I have been using a normal brow pencil, but I find they tend to look unnatural and can even rip out some hair if they are very hard. For some time now I am using the Armani Eye & Brow Maestro in Wenge Wood. I was always a bit confused which colour to go for, but I think this one is a pretty good fit. Definitely on the darker side but I just try to use very little product and be light handed with it. Then it totally works for me. I had a different colour before, I think it was Copal and it was lighter, but also way too warm toned for me. I use this product with the Armani Brush that goes with it. And girls.. even when you don't want to invest in the Armani Brow Maestro.. get the brush! 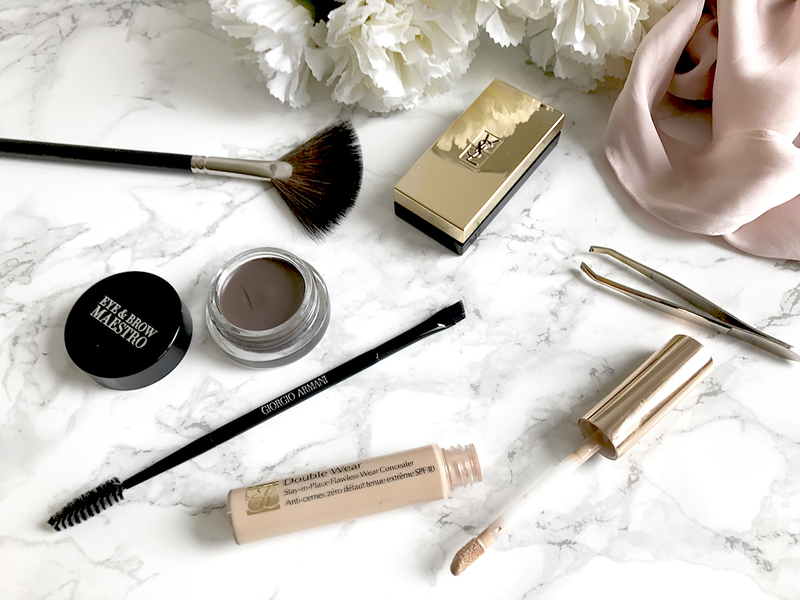 It's the best brow brush I have come across so far! I always start with a soft line on the bottom of my brows, then I do one on the top but I don't start right at the beginning of my brows on the top if that makes sense. Then I lightly fill in the gaps. And the most important part, brush through the brows in the end to give the most natural result. You could leave your brows here, but I like to perfect them a bit more. For this, I use my Estee Lauder Double Wear Concealer in 01 Light to shape and tight line my brows. This makes the biggest difference! For highlighter, I like to give a bit of the YSL Couture Mono Eyeshadow in 12 Fastes on my browbone with the Da Vinci Highlighter Brush. And I am done! Now I would totally love to know which products you use for your brows! My favourite place to shop prints. Happy Sunday everyone. Life is a little crazy right now as I moved house and started my Master.. but I still wanted to get this post out today. Interior is something that I don't talk much on here but still is a big passion of mine. I really hope to write these kinds of posts more often in the future and I also hope you guys will enjoy it. Today I want to introduce you to my current favourite prints and the shop I like to get them from. I know that prints, and art in general, can be quite an expensive thing to invest in. As a student, I don't have the biggest budget to splurge on luxury things like these so I appreciate a more affordable option. 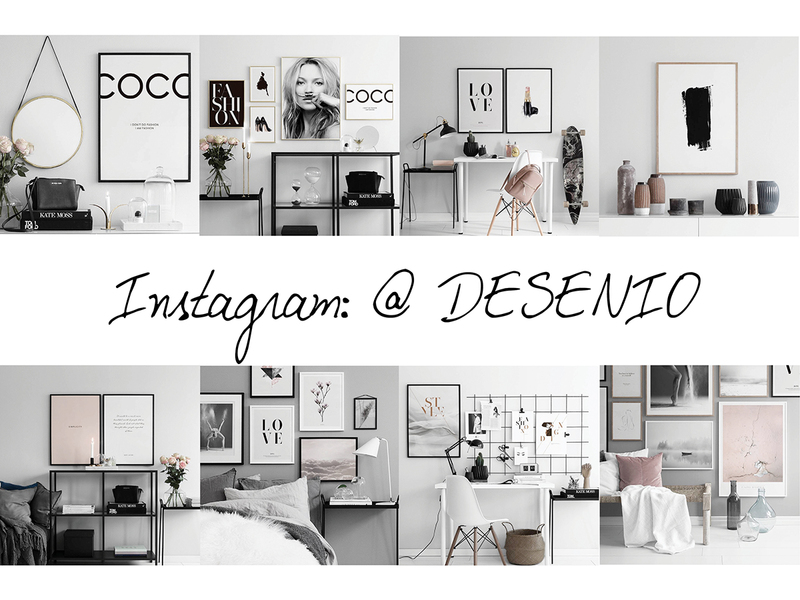 A year back I discovered the online shop Desenio on Instagram. I was absolutely blown away by their selection of prints. Their style is absolutely my thing. Modern, sleek but they still have something special to them. You can get all kind of prints in their shop. They have quotes, photographs or just abstract art. I got my first few prints from them a few weeks back. I always thought they would be quite expensive so I never bothered to look into it too much. I just admired the beautiful interior photographs on their Instagram. But one day I just went on their website and looked into it. And it is really so much more affordable than you would think. And now I think I am addicted haha. I already have a new list of prints I want to get. Unfortunately, my boyfriend isn't the biggest fan of the ideao of having Fashion and Makeup related prints in our home... so they probably will be forever on my wishlist. I personally love quite simple prints. For the colour scheme, I obviously love black, white, grey and blush colours haha.. what a surprise! A good marble pattern is also something I can't say no to. And you know the best thing? You can even buy the matching frames on their website, again very affordable. 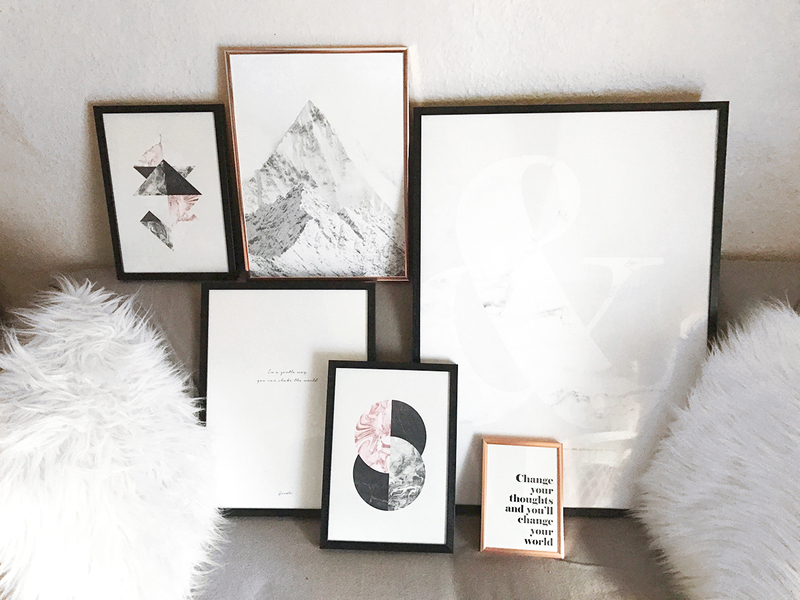 I went for a mix of black and rose gold frames as this is the kind of colour scheme I want in my home.. 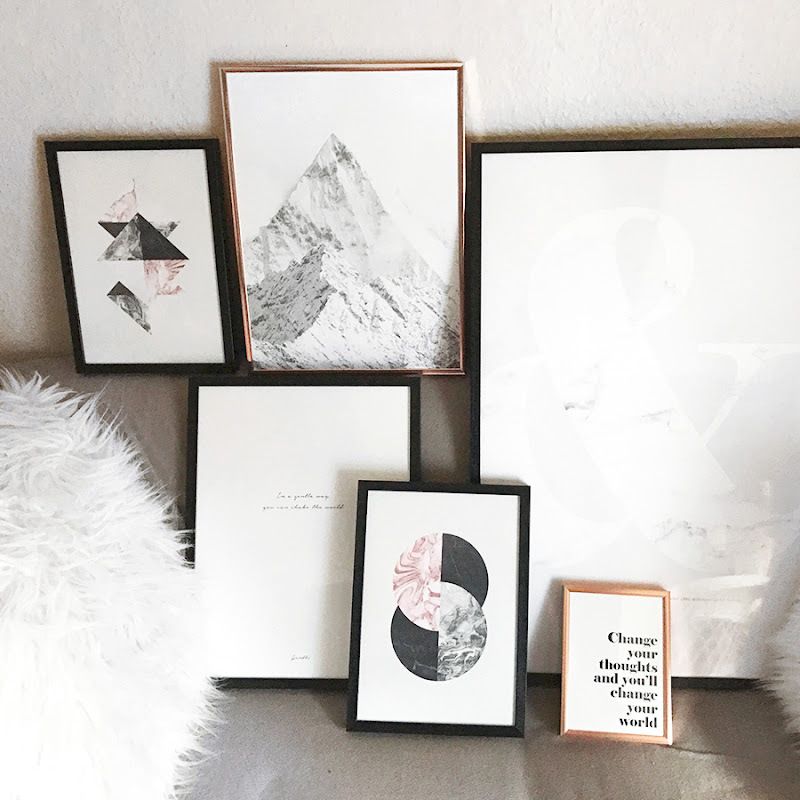 I would love to know what you like when it comes to prints/ wall art!